Party entertainer for children. It's Magic! Great Scott serves all these cities and more. He travels throughout the midwest. Great Scott "It Must Be Magic!" provides wonderfuly magical entertainment for children of all ages. He's a one-man bundle of enthusiastic grins and giggles, amazingly-funny, down-right incredible, highly energetic and highly enjoyable magician. Need entertainment for a birthday party? Are you planning a holiday event? Special occasion like a wedding recpeption? bar/bat mitzvah? Sunday school or gospel outreach? Are you planning a Cub Scout banquet? School assembly? Library reading program? Maybe you just need a break from the kids (sorry, babysitting isn't on the list). But just about any other occasion you can think of is. 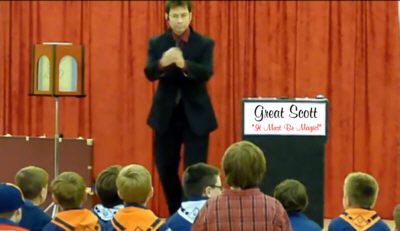 Great Scott's shows are age appropriate and filled with everything a kid wants in a show. There's lots of interaction and audience involvement. You'll hear laughter (and not just from the kids!) Adults enjoy Great Scott's magic as well. 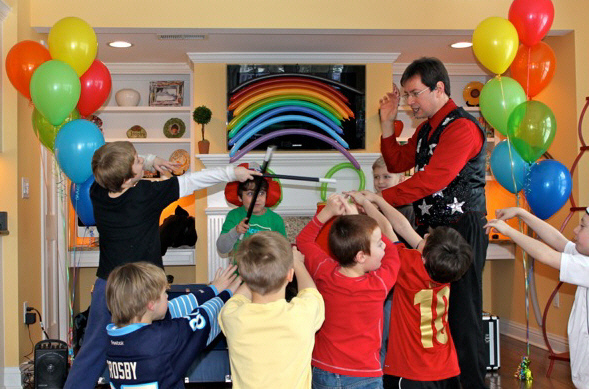 This may be the first time you are looking to hire and entertainer for a children's event. People hire entertainer's nowadays for birthday parties, summer camps, block parties, school assemblies . . . and the list goes on. But how do you know which type of entertainment you should focus on? And then who offers the best type of that entertainment? Here are a couple of great tips on how to hire a children's entertainer that will make your event awesome. The first step is to decide on what type of entertainment the kids will want to experience. There are clowns, face painters, balloon artists, musicians, jugglers, and of course magicians. Keep in mind that not all performers are created equal. Like all things, there is a range from stellar down to ...well... let's just say there's a huge range. Find a performer who is dedicated to his art. Most magicians can do tricks. But can he entertain. Is he a full-time professional? or a "weekend warrior"? Is he insured? A serious performer will be. Keep in mind that performing for children is a specialty that can take years to perfect. It takes a special personality to engage a 4 year old and a 10 year old and an adult all with the same show. Ask questions of your performer, but also, be aware of the questions he asks you. He should be seeking to understand your needs and offer options that best meet those needs. If you follow these simple tips, the kids are going to have the time of their lives. Always Family Friendly -- Always Good Clean Fun!